Anyways, thru "mountain valley water", they also distribute "tru-alka" water so we're trying that but I'm having a hard time finding good in depth info on this "tru-alka" water, if it is indeed all that they claim it is. WBH Answer: I have heard of the Tru Alka water, but I have not tried it myself. As you mentioned, there are pros and cons regarding the health benefits of alkaline water, but it is really fairly simple. Water that is slightly alkaline because it contains naturally occurring alkaline minerals is health promoting. True artesian well water, glacial melt water, mountain spring water, and true ionized water will be alkaline. Water that is acidic because the minerals have been removed through the process of distillation or reverse osmosis is not natural and does not promote optimal health. In addition, drinking water can be acidic because of chemicals (such as chlorine and fluoride) that have been added to the water either at water treatment facilities or bottling manufacturers. The site also says the Tru Alka water contains –ORP ions, which is the antioxidant potency. I seriously doubt this claim is true because I know that with fresh ionized water, the –ORP only holds for a period of a few days to a few weeks if stored properly. In other words, the negative ions are unstable. The only way to test a bottle of Tru Alka water for this property would be to use an ORP meter. If I get curious enough, I may do so at some point. I noticed that the True Alka site also sells what they call “mini pods.” They say, “Each Tru AlkaPod converts a 16 to 20 ounce bottle of any water into a 9 to 10 pH alkaline water.” So that pretty much tells you what is in the Tru Alka water. One of the biggest challenges with any type of bottled water is that you never really know what you are getting. What I have learned is that nearly 40 percent of all bottled water is actually re-processed tap water because of poor regulation. In addition, many bottled water manufacturers use descriptive terms such as “glacier water” or “mountain spring water,” which may or may not actually identify where the water is from. These are unregulated terms used primarily for marketing purposes. As you can probably tell, I am not a big fan of bottled water for a number of reasons. You can read more here about Bottled Water Facts if interested. 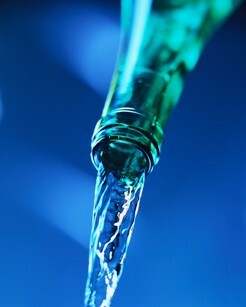 From the health standpoint, you just don’t know what you are getting with bottled water – whether it is filtered of contaminants, whether chemicals have been added for disinfection purposes, whether it is acidic or alkaline, or if it has any other properties that really make it “special” or worth the additional cost. I think a healthier and less expensive choice for good drinking water is a good countertop or under sink water filter. You can review these filter recommendations at WaterBenefitsHealth.com. Personally, I would never buy the pricier bottled waters like Tru Alka or Penta. I think they are a waste of money. If you want, you can test the pH of your bottled mountain spring water with the same pH drops that are used to test pools. That will give you a good idea if your water contains alkaline minerals. If your water is acidic, less than 7.0 pH, you can purchase liquid ionic minerals such as Trace Minerals Ionic Tonic or Liquimins and either take the minerals in juice or add them to your water once or twice a day. Just an idea . . . When you begin your search for a whole house filter, I hope you will come back and check out my reviews and recommendations.